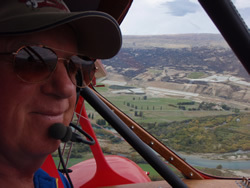 Last summer, I attended a summer fly-in at Uzhhorod, near the Slovakian border. This was to be a joint event involving AOPA, Uzhhorod Airport, the Padonki International Motorcycle Club and the Ukraine Development Institute of Flight Technologies. It was a great event; I linked up with these Brits..they attempted to teach me to drink vodka. But it was the locals who taught us all how to drink vodka. Headaches all around. See the article, entitled, East to the Steppes. After many comments regarding my lack of updates…an update…finally. Apologies with no excuses. Another gem on this airfield is a real WWI Bessoneau Type H hangar. The wood frames are the original, found in the UK. Mr. Zanardo has made a more modern copy of the canvas covering to protect his WWI collection. For the past month I’ve been using the farm runway/hangar home of a family that have become close friends, the Marchi family. They have invited me to use their facility as a base while I stay in a hotel nearby in Castel Goffredo, due south of Lago di Garda here in Northern Italy. They lend me a car when needed so I can get around for those essential things that need to be done when you’re away from home for 6 months at a time. Giovanni has helped me a great deal in the ongoing project of keeping the Red Rockette alive and well. Each of the last 3 weekends we have attended a local fly-in organized by some local aero club. All have been within 50 miles of “home”. They have all been wonderful events with many aircraft that we don’t get to see in the US. All have overfed us with excellent quality food and drink. More details of each will follow in a blog post “sometime” soon. 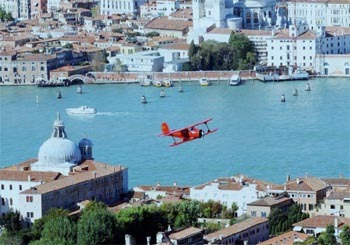 The last one, the Stradivari Fly-in at Cremona, the violin capital of the world, was magnificent. Included were classical concerts and other cultural events. Yes, it’s amazing…you get two updates within days of each other. So there I was…in the sack, out like a light, middle of the night, probably snoring…and my dream turns to jello. The hotel room is shaking…it’s a nice shake, not a violent one, but it goes on for a long time. In my daze I can’t figure out where in the world I am. I’ve been tossed around in the middle of the night in a number of places in the world but I usually don’t have a problem knowing where I am. This time it’s different. Maybe because it’s a soft gentle shake and isn’t all that scary. Maybe it’s just because I’m older but that IS a scary thought so I put it out of mind. After the first big one comes the normal after-shock. It’s also somewhat gentle. I finally remember an Italian dinner, which is now turning into curdled cheese…or a milkshake, and finally decide I’m in Italy. Yes, I’m painfully aware that it has been a long time since this message service has been updated. Life certainly can get busy at times. After spending the winter back home in Nevada I have finally returned to northern Italy, completed an extensive annual inspection with the help of a very knowledgeable and professional fellow American, and have flown the Red Rockette several times. She goes well after being looked after by good friends for the winter. 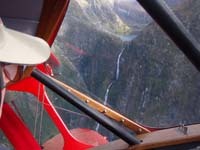 The journey from St. Georgen airfield in Austria to Italy began back on Sept 27, 2011. I was pleasantly surprised by the president of the local aero club stating that he and his family, who have been very good friends to me, would fly with me in loose formation on the first leg of my journey to the south. 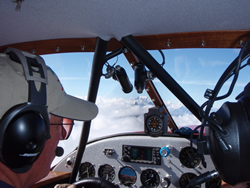 We left the airfield, located roughly 30 km southeast of Linz, Austria, to fly south through wonderous valleys, around massive peaks and over clear blue lakes of the magnificent high Alps. I had a consistent smile and sense of awe as the views changed in the windscreen. These views and the lovely 9 cylinder symphony of the P&W up front made for a most memorable experience. My friend did the leading as he was the local expert so all I had to do was keep up and watch all this beauty slide by. All too quickly we had crossed into Slovenia and the coastal airfield of Portoroz came into view. The last report left the Red Rockette and this old duffer busy getting ready to leave the lovely, historic soaring site of Spitzerberg just east of Vienna, Austria. Just a couple of days prior to leaving, a crew from Austrian National TV showed up. A hasty formation flight briefing was completed with the director of the local Aero Club and a local flight over the magnificent grounds of a local schloss (palace) was flown with the crew.One of the joys of watching young people grow up is seeing them when they now have married and have their own children. Well, it’s been a beautiful day in Zell am See, Austria. But why am I here when I had planned to go to Turkey, Greece, Croatia, and Italy from Cyprus prior to Austria? In June, 2011, I had traveled from home in Reno, Nevada back to Cyprus to rejoin my mistress, The Red Rockette at RAF Akrotiri. There was a good deal of work to do on her after sitting for about 5 months or so. I had planned to be there earlier but “life” got in the way. So finally, I was back in Cyprus with old friends and plans to do some local touring this time. And I actually did that. A very pleasant day was spent up north of Paphos in Polis, site of an ancient port which no longer exists. Nearby was a small church overlooking the Med that had quite a collection of walking aids, crutches, and other bits and pieces that folks had discarded due to their being healed during their visits to the chapel. Going back a few days into last week I mentioned that I had found a tour operator and made arrangements to head south from Amman, Jordan to the ancient city of Petra. I will leave the major tourist info for you to Google. This way it will not be second or third hand info. But I will give you my impressions of these two wonderful sites that I highly recommend visiting. Being a happy wanderer has many advantages, mainly that I can set my own schedule an change it at will when something of major interest comes along. I hired a private car with driver and headed south from Amman on Friday morning, 7 Jan, 2011. I left off several days ago saying that flight clearances had delayed me here in Amman, Jordan. The clearance issue revolved around the fact that after I arrive at my next destination, Paphos, Cyprus, I intend to fly to the Akrotiri Royal Air Force Base just 25 miles from Paphos. Because of this Staggerwings WWII British history, it has been invited to use some storage facilities there for a few months while I return to the US. I am very grateful for that invitation. The serving RAF personnel at the base have been extremely helpful in this matter. As an ex-serviceman myself, it is with pride that I acknowledge their service to their country. Where is Captain Biff and the Red Rockette today? Click to learn more Wings of Hope, 2011 Nobel Peace Prize Nominee, can use your support for the humanitarian work they do to bring self-sufficiency to more than 1,000,000 people annually in more than 140 countries. How's the weather where you are, Capt Biff?